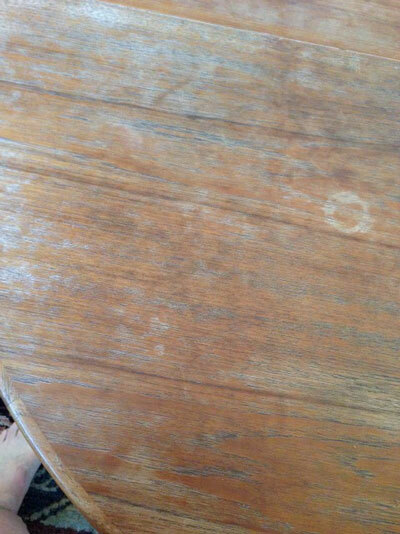 How to Refinish a Teak Laminate Table - Schoenbauer Furniture Service, Inc.
A: Scrubbing with fine-gauge steel wool and then applying oil is often appropriate as a way to restore the surface on teak furniture, whether it’s solid teak or laminated with just a teak veneer. Brandon Webster of Gallery 2112, a D.C. dealer of mid-century modern furniture, sculpture and art, said that’s often what he does. However, after looking at the pictures you sent, he suggested the damage might be too much for this simple approach to work. Also, given the vintage of your table, he said he fears the original finish was not oil but lacquer or even polyurethane, which wouldn’t respond well to the treatment you suggest. He recommended turning to Jeremy Fair, who ran Modern Laboratory Restoration, a furniture-repair company in Washington, until it closed after a fire a year ago. Fair, who can be reached at 703-347-5088 or modlabdc@gmail.com, looked at the pictures and said he is virtually certain the original finish was lacquer. He said he would carefully sand off the finish, treat any remaining dark stains with oxalic acid, oil the surface to bring out the grain, then spray shellac sealer followed by two or three coats of lacquer. He estimated the cost at $950 to $1,250. Or you could follow a similar approach and do the work yourself. Katie Schoenbauer Morgan of the furniture-restoration company Schoenbauer Furniture Service (800-955-7603; schoenbauer.com)said her company advises DIYers who want to restore tables like yours to sand the surface, using nothing coarser than 220 grit. (You can sand by hand, going in the direction of the grain, or if you are very careful and used to using a power sander, do the initial work with a random-orbit sander, followed by hand-sanding.) Wipe away all the dust. An oil finish is the easiest final step. Build it up in layers over several days. Or, if you have access to spray equipment, you can spray on lacquer, which is more resistant to damage from oil and water. Doug Meyers, owner of Modern Mobler (202-882-1648; modernmobler.com), a store in the District that carries a lot of Scandinavian modern furniture, recommends the same basic approach as Morgan: sanding with 220-grit sandpaper, then oiling. “You’re going to want to apply multiple coats of teak oil to build up the finish again,” he said.